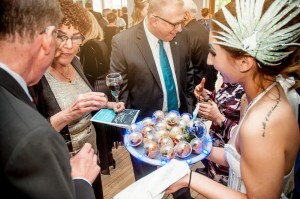 Last night we were honored to cater the American Lung Association of Minnesota’s Inaugural Oxygen Ball! We started off the night with appetizers being passed around by servers decked out in bubble themed attire and had such a great time adhering to the theme with items like our Spicy “Grilled & Chilled” Shrimp Shooters and Blue Sushi…yes, we said BLUE sushi! 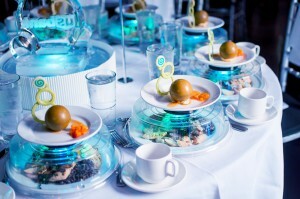 Next up was our plated dinner, which was chilled and served on light-up trays from Event Lab, and we ended with our Champagne Bellini Bubble dessert which was made with a delicious chocolate sphere, white chocolate champagne mousse, peach coulis, and champagne macerated peaches! We had such an amazing time visualizing and executing this event and are honored to have played a roll in supporting such an amazing cause and organization! “A BIG THANK YOU is not even enough to express the huge gratitude we have for what John Chesnut and the whole CRAVE team just provided for the inaugural Oxygen Ball. I think of words like phenomenal, exceptional, and extraordinary when I think of what John and the team planned for us last night, but actually he went so far beyond that there is not even a word for it. He is the definition. We are so blown away. I wish I would have recorded the comments and compliments from so many people at the event.